Lamartine an eternal source of inspiration was one of the greatest French politicians, poets, and writers. His work wasn’t confined to a particular subject. Rather he touched every aspect of life through his creative works. Alphonse de Lamartine poems and quotes on desire, hope, grief, achievement, experience, and other subjects are thought provoking and inspiring. 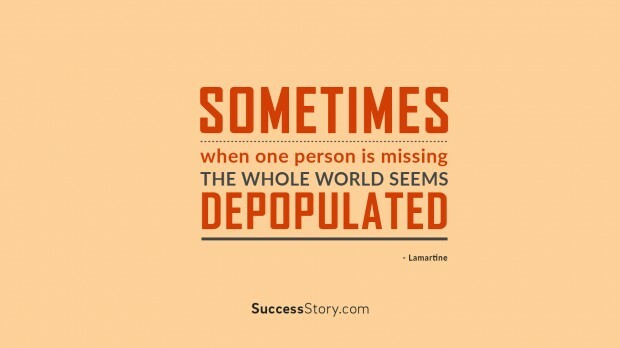 "Sometimes When One Person Is Missing The Whole World Seems Depopulated"
Lamartine’s quotes, poems, and books are highly regarded for their value. His works featured sincere feelings and moral values. His quotes about life, women, God, and other subjects boast an unparalleled value. He always regarded women superior to men. His various quotes defining the worth and high value of women are the proof of the fact. He was of the thought that a woman is the originator of all great things that happen in the world. There are countless Lamartine quotes in French that showcase Lamartine’s great thinking and high moral values. In one of his writings, he mentioned that mother earth expresses and feels by her aspect and form, in splendour or in melancholy. The other quote of Lamartine says that to love people is to believe in God. People should stay at ease and enjoy the lucky throw of the dice. The chance that turns up for the people, boasts a secret and a joy factor. The world is like a lottery so we should always enjoy the game. There is good and bad in this world for every individual. We should learn to enjoy and stay happy and satisfied in every situation. Lamartine quotes are worth considering to lead a better life.